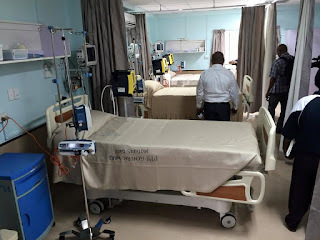 With the inclusion of its newly opened Intensive Care Unit (ICU), the Paradise Private Hospital has transitioned itself from being a clinic to now becoming a fully functional hospital. Chief Executive Officer, Dr Robin Sios today, during the hospitals dedication ceremony mentioned that with the increasing demand for healthcare in the country, PPH is extending its services into specialised health care. “In such a short space of time since the new management came in, many changes have taken place including the achievement of having the three (3) bed Intensive Care Unit (ICU),” said Dr Sios. “The Hospitals aim is to provide the best health care service in the country and with the notable inclusion of our new Cardiac Testing Unit, people don’t have to travel overseas to receive special treatment,” he said. With increasing lifestyle diseases (hypertension, diabetes, heart attack etc. ), the Cardiac Testing Unit-which is one of only two other such machines available in country, will provide screening for people in early diagnosis and prevention of many lifestyle diseases.